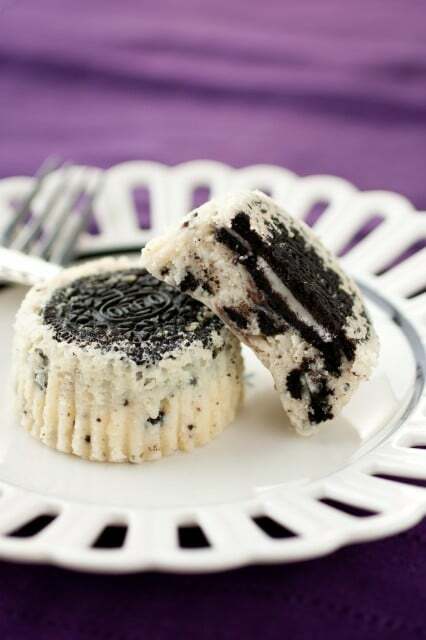 Mini Oreo Cheesecakes – rich and creamy Oreo studded cheesecakes in fun individual servings. These are the perfect dessert! One of my favorite desserts ever since I was a little girl is Cookies and Cream Ice Cream, whether it be a vanilla or chocolate version. It’s just perfect. I love anything with a generous helping of cream in it, I’m sure I get it from my Mom. It’s likely that butter and cream are on her list of top 5 favorite foods =). These cupcakes taste just like that beloved Cookies and Cream Ice Cream, but rather in cheesecake form. 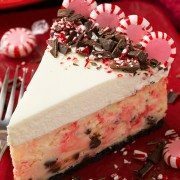 I adapted this from my favorite white chocolate cheesecake because white chocolate mimics the flavors of cream to me. These cupcakes are dangerous, but when they come in their cute petite form (compared to a large slice of cheesecake), it’s a little bit easier to use portion control. Although, once you’ve tasted one you’ll still likely want at least one or even two more. Cream and chocolate wafer cookies = one of the best pairings ever created. Thank you whomever came up with such a simple, yet deliciously incredible combination. 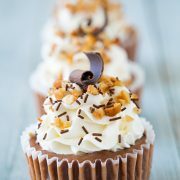 Enjoy these creamy, chocolaty cupcakes of pure luxury and do your best to share! 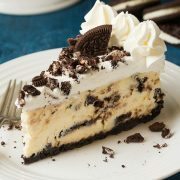 Rich and creamy Oreo studded cheesecakes in fun individual servings. The perfect dessert! Preheat oven to 300 degrees. 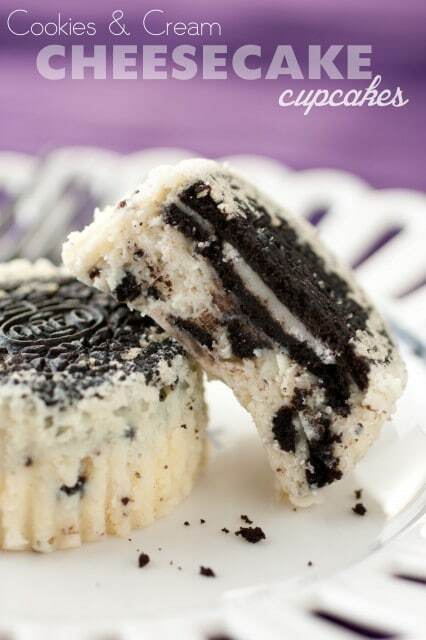 Line 20 muffin cups with paper liners and place one Oreo in the bottom and center of each of the 20 cups, set aside. Chop remaining 8 Oreo cookies into small pieces, set aside. In a mixing bowl, using an electric hand mixer set on medium speed, whip together cream cheese and sugar until smooth, about 1 minute. Blend in eggs. In a microwave safe bowl, combine white chocolate chips and cream and heat mixture on 50% power in 30 second intervals, stirring after each interval until melted and smooth. Pour melted white chocolate chip mixture into cream cheese mixture, along with vanilla extract. Blend mixture until combined. Tap mixing bowl forcefully against counter top several times to release some of the large air bubbles in the cheesecake mixture, then fold in remaining 8 chopped Oreos. Divide mixture among 20 muffin cups (right over the top of each Oreo), filling each cup about 3/4 full (about 1/4 cup in each). Bake in preheated oven about 20 minutes, or until filling is set. Remove from oven and allow cupcakes to rest in muffin tin for 10 minutes before transferring to a wire rack to cool. Cool completely on a wire rack, about 1 hour, then transfer to an airtight container, in a single layer, and refrigerate 4 hours or overnight. Store cupcakes in refrigerator and serve chilled. How many cheese cream do i have to use in gram? To change them into gram measure?